Faro is the Algarve’s largest city and the capital of the Algarve as well. The food in Faro is a mix of both regional Algarve dishes and more national Portuguese dishes, and it’s a fantastic place to try both. It’s also very well connected with the rest of the Algarve, so it’s easy to venture out to nearby foodie meccas like Olhão (for seafood) and Guia (for piri-piri chicken). Restaurants in Faro range from hole-in-the-wall style joints, and there are certainly a few of those, to more upmarket restaurants offering Michelin-style fine dining. One isn’t necessarily better than the other although, if you’re looking to try typical Portuguese and Algarvian dishes, the more traditional restaurants are going to give you the most accurate representation. Every region of Portugal has its own dishes and cuisine, and the Algarve is no different. Algarve food is very seafood-focused, but there are also quite a few interesting meat dishes that come from the interior of the Algarve as well. 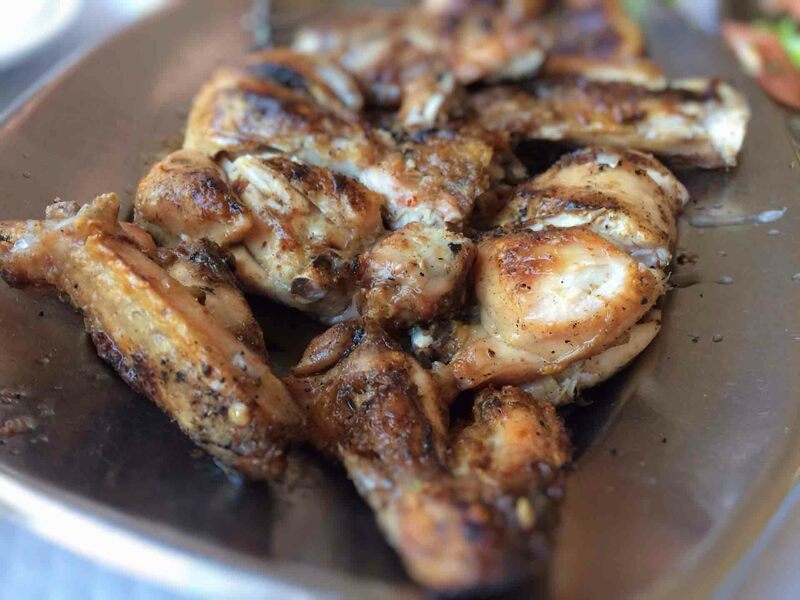 Although you’ll find many of these dishes on menus throughout the whole of Portugal, particularly dishes like piri-piri chicken, it’s really worth trying them while you’re here in the Algarve. In fact, some locals would even argue that it’s not worth eating these dishes unless you’re in the Algarve. 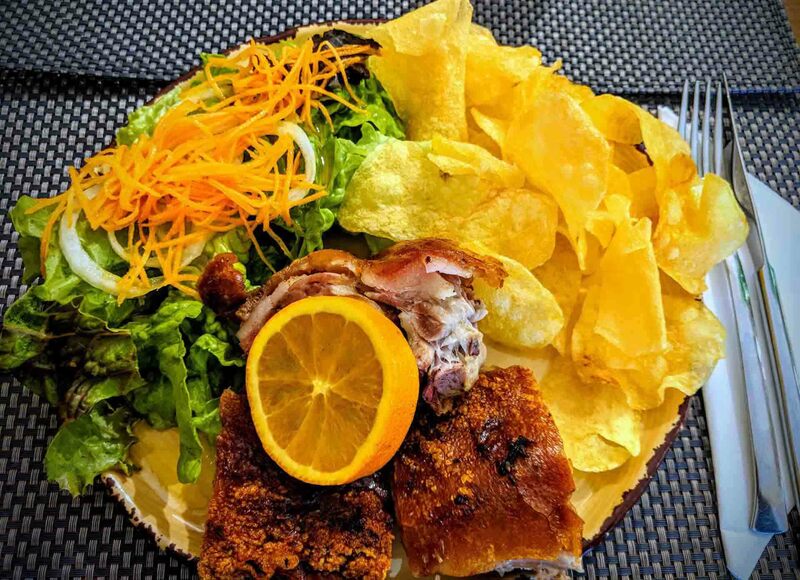 Faro, as the capital city, has plenty of great restaurants where you’ll find all of the dishes mentioned below, as well as dishes from across the rest of Portugal and other countries as well. It’s hard to pinpoint exactly where frango piri-piri originated but, one thing’s for sure, the Algarve is famous for it. Guia is the town most associated with piri-piri chicken, and it’s here that the annual piri-piri chicken festival takes place in August (Festa do Frango da Guia), but that doesn’t mean you can’t find good piri-piri chicken elsewhere on the Algarve. Traditionally made from copper, the cataplana is a clam-shaped dish that’s sort of like a rudimentary pressure cooker. Cataplana is also the name for the dish cooked in this pot, and it’s a dish that’s very much associated with the Algarve. Cataplanas are essentially stews and, because they originate from the Algarve, are often fish or seafood-based. Common cataplanas include cataplana de marisco (seafood cataplana), cataplana de peixe (fish cataplana), cataplana de peixe e marisco (fish and seafood cataplana), cataplana de carne de porco com amêijoas (pork cataplana with clams). Portugal as a whole is a country that loves its seafood, and a lot of it comes from the Algarve. A lot of that seafood, particularly oysters, actually comes from the Ria Formosa, which is just a short drive from Faro. The best way to try Portuguese seafood it to visit a marisqueira, a restaurant that specialises in seafood. Here, you can try local favourites which include oysters, tiger prawns, clams, prawns, and percebes. Sardine season is a popular time in Portugal, particularly in Portimão which hosts an annual sardines festival (normally in August). Although Portimão is the place to get sardines on the Algarve, you will still find plenty of great sardines in Faro as well. Although Algarve food is very fish and seafood-focuses, many of the dishes from inland Algarve focus more on meat. Javali (wild boar) is one example of this, and it’s something that you’ll see on restaurant menus throughout Faro and the Algarve. There are many different Portuguese recipes for javali. Sometimes it’s served grilled and sometimes it’s served as a stew. Either way, it’s definitely worth trying. Of course, you don’t have to limit yourself just to dishes that are typical to the Algarve. As well as Algarvian cuisine, there are plenty of Portuguese dishes that are worth looking out for. 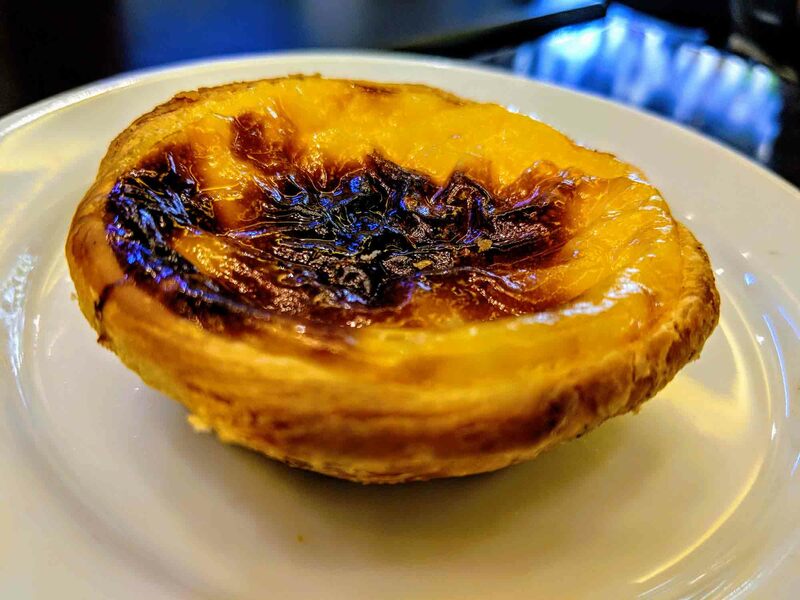 You can’t leave Portugal without trying a pastel de nata, and you’ll find these in every café in Faro and across the Algarve. Simple yet delicious, you’ll probably end up eating at least one per day while you’re in Faro. Bacalhau, which is salt-dried cod, is Portugal’s national dish. There are more than 365 different ways to cook bacalhau according to the Portuguese, and every restaurant in Faro will probably have some form of bacalhau on the menu. Some bacalhau dishes that are worth adding to your foodie bucket list include bacalhau com natas, bacalhau à lagareiro, and bacalhau com broa. Leitão is a suckling pig that’s normally between 4 and 6 weeks old and still feeding on its mother’s milk. The pig is normally spit-roasted over a wood fire and, as you can imagine, is extremely tender and succulent. Leitão is normally served with chips (fries) or potatoes, but you can also get it as a sandwich as well (sandes de leitão). It’s a dish that’s typically associated with the Bairrada region of Portugal, although you’ll find it everywhere in Portugal (including Faro). If you’re planning on trying leitão while you’re in Faro, it’s worth going to a restaurant that specialises in it (they normally have leitão in the name). 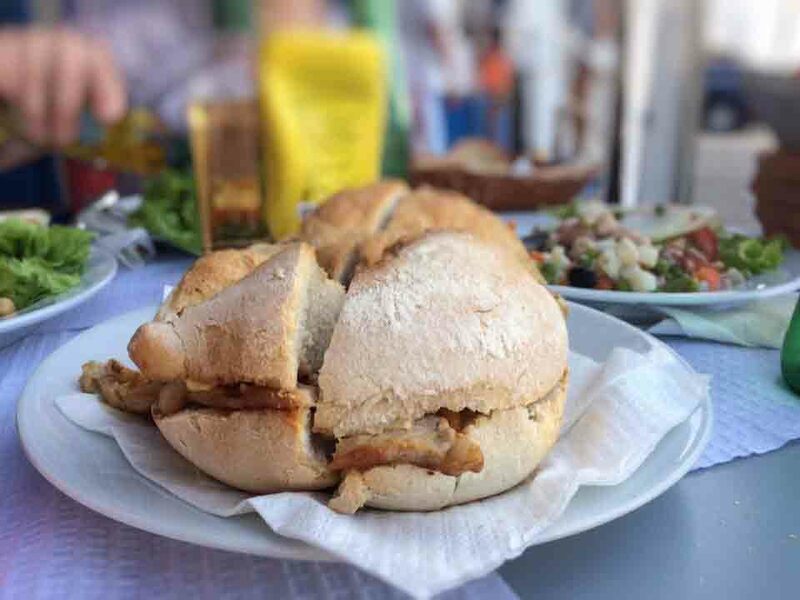 The bifana is a small bread roll that’s filled with fried, garlicky slices of pork and often topped with mustard. It’s not normally a meal in itself, but a snack that you will find in just about every pastelaria in Faro. If you’re in between meals, and feeling a little peckish, take the time to try Portugal’s best sandwich. Want more dishes? Read the complete guide to Portuguese food. Throughout the year, several food events take place in Faro including beer festivals and seafood festivals. If you’re in Faro while any of these events are happening, it’s worth paying them a visit. Alameda Beer Festival (July) – Faro’s annual beer festival normally takes place in July, and normally features more than 100 different beers that you can try. 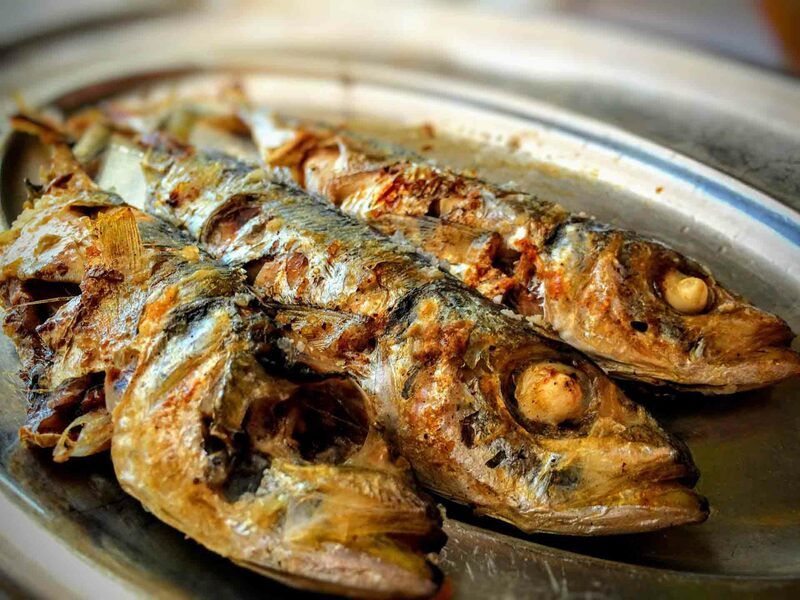 Festa da Ria Formosa (July) – Festa da Ria Formosa celebrates the best seafood from the nearby Ria Formosa. It’s a fantastic chance to sample traditional Algarve food and to enjoy some live music and street entertainment as well. Olhão Festival do Marisco (July) – Olhão isn’t quite Faro, but it’s less than 20 minutes by car. It’s one of the best destinations in the Algarve for seafood and, so naturally, the Olhão seafood festival is a food festival that’s not to be missed. Feira de Santa Iria, Faro (October) – The Feira de Santa Iria isn’t a food festival, but it is Faro’s oldest and longest-running festival. As well as entertainment and arts and crafts, there’s always plenty to eat and drink and it’s a good opportunity to sample some Portuguese street food as well. Want to know about other events in Faro? Be sure to read the complete month-by-month list of Algarve events. As well as the food festivals, and scouting for all of the dishes mentioned above, the following food tours and other activities are perfect for keeping you entertained during your trip to Faro. 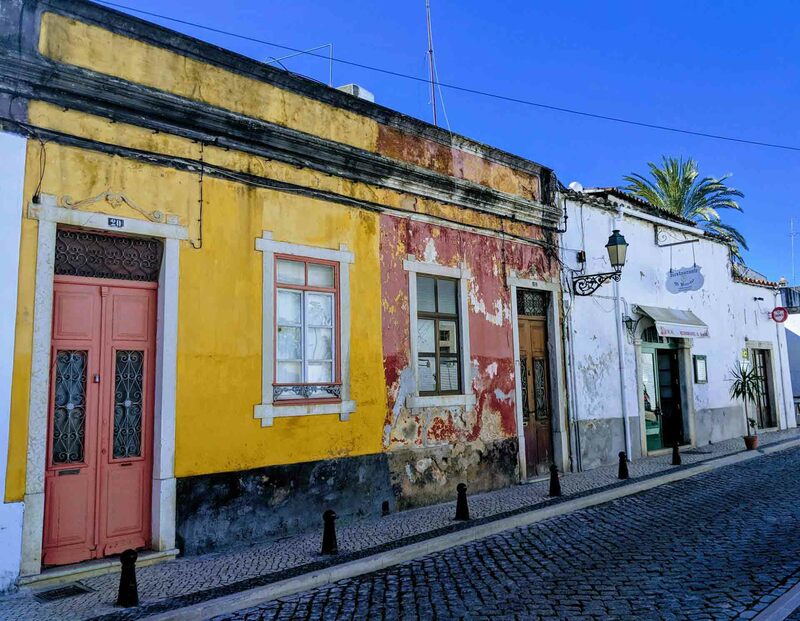 Take a Portuguese cookery class – There are several organisations in the Algarve that offer Portuguese cookery classes, including Taste Algarve in nearby Tavira and Tertúlia Algarvia in Faro. Drink craft beer – Portugal’s craft beer scene is slowly hitting the Algarve, and there are already a few craft beer bars and breweries in Faro. Visit Faro market – Visiting Faro market gives you a chance to see a typical Portuguese market in action. Here you’ll find stalls selling fruit, vegetables, meat, and fish, as well as other local Algarve products. Visit Olhão market – If you’re particularly interested in seafood, and especially if you’re interested in cooking some seafood at home, it’s worth taking a trip to one of the Algarve’s best seafood markets.